Yudhisthira Maharaja said, “O Kesava, what is the name of that Ekadasi that occurs during the light fortnight of the month of Asadha (June-July)? Who is the worshipable Deity for the auspicious day, and what is the process for observing this event? Lord Sri Krsna replied, “O caretaker of this Earthly planet, I shall gladly tell you a wonderful historical event that the deva Lord Brahma once narrated to his son Naradaji. Lord Brahma replied, “O great saintly orator, O best of all sages, O purest devotee of Lord Visnu, your question is as usual excellent for all mankind. There is nothing better than Ekadasi, the day of Lord Sri Hari, in this or any other world. It nullifies even the worst sins if observed properly. For this reason I shall tell you about this Asadha-sukla Ekadasi. 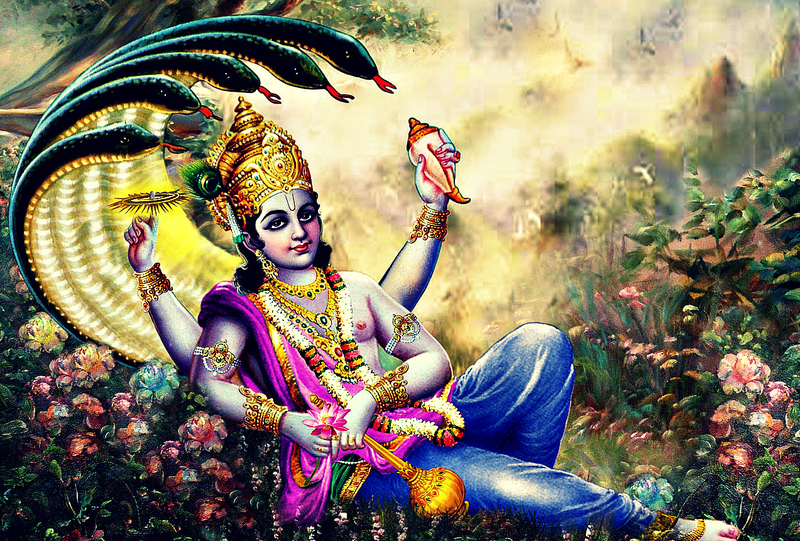 „Fasting on this Ekadasi purifies one of all sins and fulfills all ones desires. Therefore, whoever neglects to observe this sacred fast day is a good candidate for entering into hell. 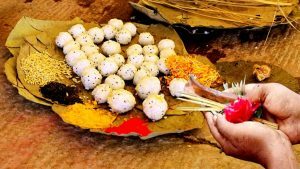 Asadha-sukla Ekadasi is also famous as Padma Ekadasi. Just to please Hrsikesa, the master of the senses, one should fast on this day. Listen carefully, O Narada, as I relate to you a wonderful historical event that was recorded in the scriptures regarding this Ekadasi. Just hearing this account destroys all kinds of sins, along with all obstacles on the path to spiritual perfection. „O son, there was once a saintly king in the Sun dynasty whose name was Mandhata. Because he always stood up for the truth, he was appointed emperor. He took care of his subjects as though they were his very own family members and children. On account of his piety and great religiosity, there was no pestilence, drought, or disease of any kind in his entire kingdom. All his subjects were not only free of all kinds of disturbances but also were very wealthy. The king’s own treasury was free of any ill-gotten moneys, and thus he ruled happily for many years. “Once, however, because of some sin in his kingdom, there was a drought for three years. The subjects found themselves beset by famine also. 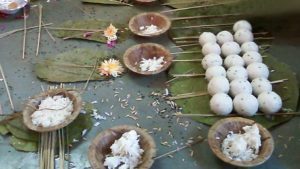 The lack of food grains made it impossible for them to perform the prescribed Vedic sacrifices, offer oblations to their forefathers and to the devas, engage in any ritualistic worship, or even study the Vedic literatures. Finally, they all came before their beloved king in a great assembly and addressed him thus, “O king, you always see to our welfare, so we humbly beg your assistance now. Everyone and everything in this world needs water. Without water, almost everything is rendered useless or dead. The Vedas call water nara, and because the Supreme Personality of God sleeps upon water, His another name is Narayana. God makes His own abode on water and takes His rest there. In His form as the clouds, the Supreme Lord is present throughout the sky and pours forth rains, from which grow the grains that maintain every living entity. Thinking in this way, King Mandhata assembled his army and entourage. Paid his obeisances to me, and then entered the forest. He wandered here and there, seeking great sages in their asramas and inquiring about how to resolve the crisis in his kingdom. At last he came upon the asrama of one of my other sons, Angira Muni, whose effulgence lit up all directions. Seated in his hermitage, Angira looked like a second Brahma. King Mandhata was very pleased to see that exalted sages, whose senses were completely under control. “The king immediately dismounted his horse and offered his respectful obeisances at the lotus feet of Angira Rsi. Then the king joined his palms and prayed for the Muni’s blessings. That saintly person reciprocated by blessing the king with sacred mantras; then he asked him about the welfare of the seven limbs of his kingdom. “After telling the sage how the seven limbs of his kingdom were situated, King Mandhata asked the sage about his own situation, and if he was happy. Then Angira Rsi asked the king why he had undertaken such a difficult journey into the forest, and the king told him of the affliction his kingdom was suffering. The king said, “O great sage, I am ruling and maintaining my kingdom while following the Vedic injunctions, and thus I do not know the reason for the drought. To solve this mystery, I have approached you for help. Please help me relieve the suffering of my subjects. “Angira Rsi said to the king, “The present age, Satya yuga, is the best of all ages, for in this age Dharma stands on all four legs. In this age everyone respects brahmanas as the topmost members of society. Also, everyone fulfills his occupational duties, and only twice-born brahmanas are allowed to perform Vedic austerities and penances. Although this is a standard, O lion among kings, there is one sudra who is unlawfully performing the rites of austerity and penance in your kingdom. This is why there is no rain in your land. You should therefore punish this laborer with death, for by so doing you will remove the contamination inflicted by his actions and restore peace to your subjects. Upon hearing these words, the king offered his obeisances and then returned to his palace. When the Padma Ekadasi arrived, King Mandhata assembled all the brahmanas, ksatriyas, vaisyas and sudras in his kingdom and instructed them to strictly observe this important fast day. After they had observed it, the rains fell, just as the sage had predicted, and in due course of time there were abundant crops and a rich harvest of grain. By the mercy of the Supreme Lord Hrsikesa, the master of the senses, all the subjects of King Mandhata became extremely happy and prosperous. Thus ends the Vrjavasi narration of the glories of the Asadha-sukla Ekadasi – also known as Padma Ekadasi or Deva-sayani Ekadasi – from the Bhavisya-uttara Purana.